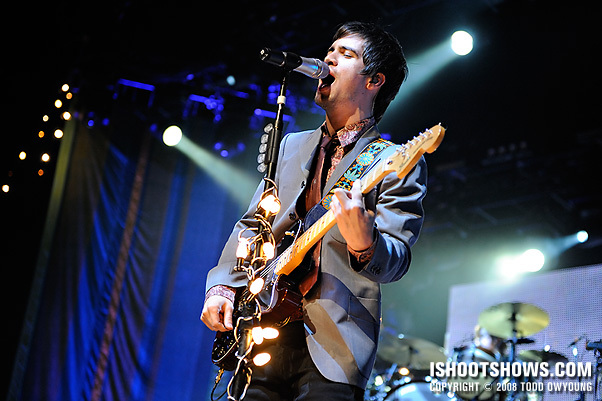 October 19, 2008 – Following performances by Dashboard Confessional, The Plain White T's, and The Cab, Fueled By Ramen artists Panic At The Disco closed out Rock Band Live Tour in a big, bright performance that had the house on their feet and singing back every word. 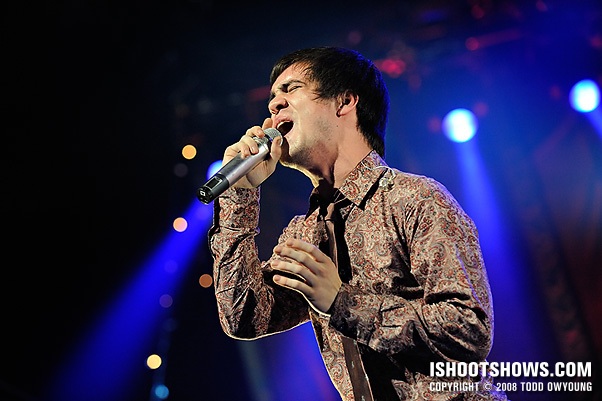 In comparison to “Baroque Pop” look of their 2005 tour for A Fever You Can't Sweat Out, the Las Vegas rock band came out in threads inspired by the 1970s, rather that the 1700s, sporting paisley and stripes. 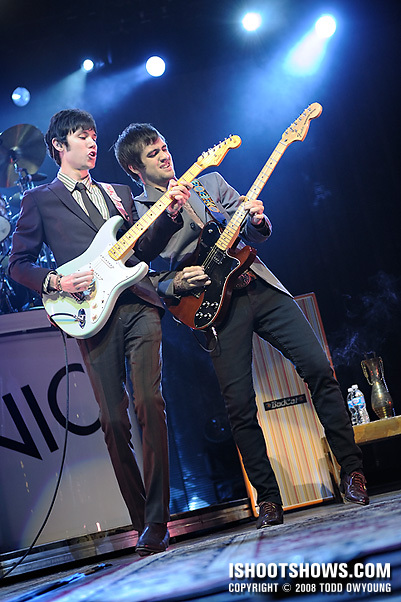 Brendon Urie led the charge on lead vocals and rhythm guitar, joined on his right by Ryan Ross on lead guitar. 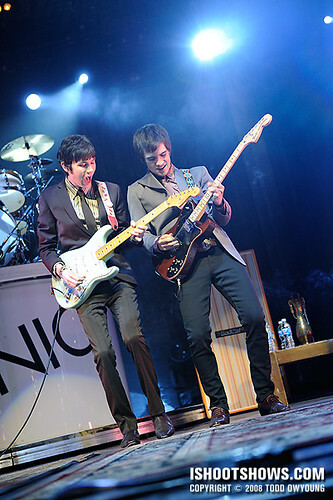 The two frequently came together on stage to play together and seemed to be having a great time on stage. 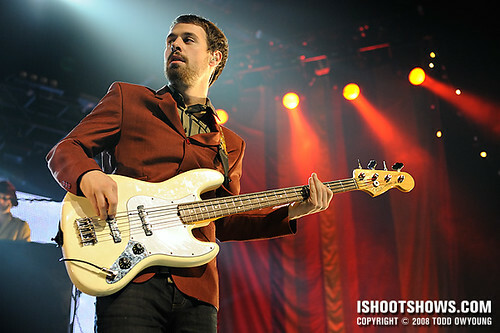 Relative newcomer Jon Walker took up position stage left and was the most low-key member of the band at the front of the stage in comparison to the more exuberant Urie and Ross. Walker replaced former bassist Brent Wilson in 2006. 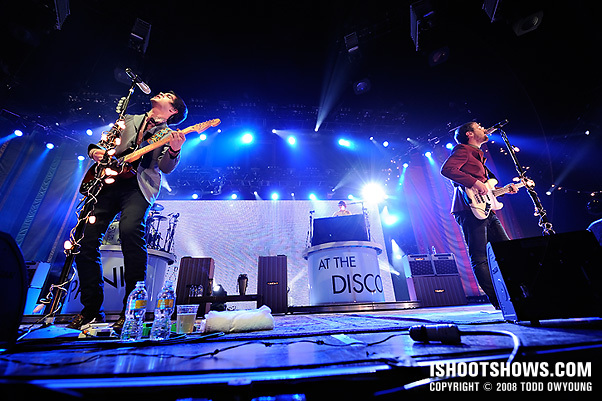 At the back of the stage, Spencer Smith kept tight beat, positioned on a five-foot circular platform stage right. A touring keyboardist was seated on another platform stage left. 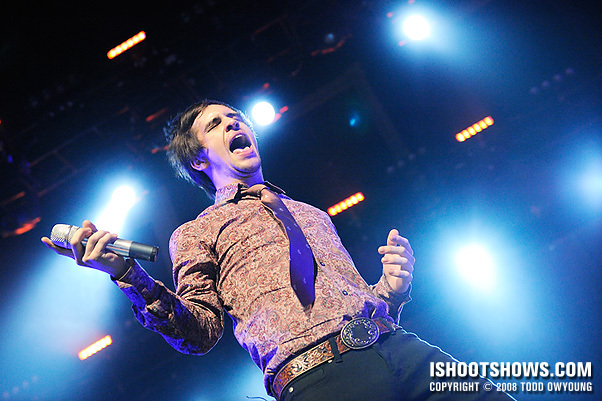 After performances by three other bands, Panic At The Disco took the stage at 9:40 PM. Compared to Dashboard Confessional's slightly slower-paced songs, the first three for Panic really flew by. The stage for this tour is about five-feet tall, so it's actually quite reasonable as far as arena gigs go. In addition, the only crates in the pit projecting out from the stage were isolated to the sides of the stage, while the center was open, so it was possible to get up fairly close. Coming right after Dashboard Confessional, which had the best lighting of the night in terms of being photo-friendly, Panic's stage treatment was disappointing. The lighting for the first three songs was rather “dirty,” with lots of contrasting color combinations, such as red and blue or red and green. There was essentially no pure white light, and most of the light at the front of the stage took the form of orange-ish tints. I shot this set with the Nikon D3 and D700, with the Nikon 24-70mm and Nikon 70-200, respectively. The range of these two was just fine for this performance. If I were only shooting with one body, I think the 24-70mm would have served me very well with few lens changes. Stay tuned for the full sets from the rest of Rock Band Live! The lighting for Dashboard is good, I promise. I thought the lighting for The Plain White T's was very photogenic as well, especially the first song. 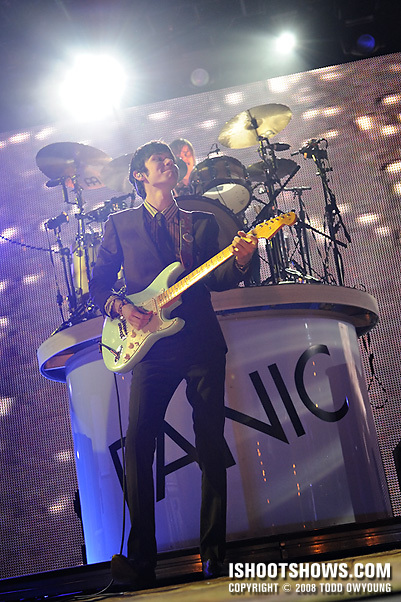 In the meantime, check out images from Panic's performance at the Pageant earlier this year, which had some great lights. All images are copyrighted. Unauthorized use and reproduction is expressly prohibited. You got some great shots, Todd! 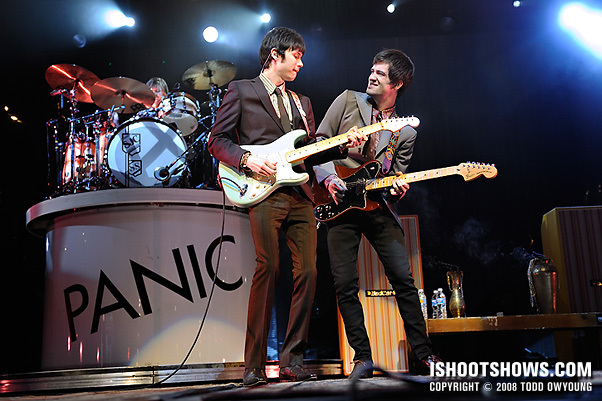 This one of Ryan and this one of Jon are particularly awesome, as are those with Brendon and Ryan playing together. There’s a really great feeling of depth to this set. Hey Kate! Thanks for the comments, I think you picked out my two favorite shots for best lighting (Ryan and Jon)! I appreciate the feedback. Such an awesome set Todd. I love the very last one, with the huge wide angle. For such “bad” lighting, everything looks amazing, once again. Hey Nathan, thanks. I just had to bring out the 14-24mm once for this set to get a little ultra wide on this massive stage. i see lots of bokeh .. love the wide angles shots. when i saw it, i thought “didn’t he say it was BAD lighting” ? still amazing as usual. Hey Jessie, thanks for the comment. 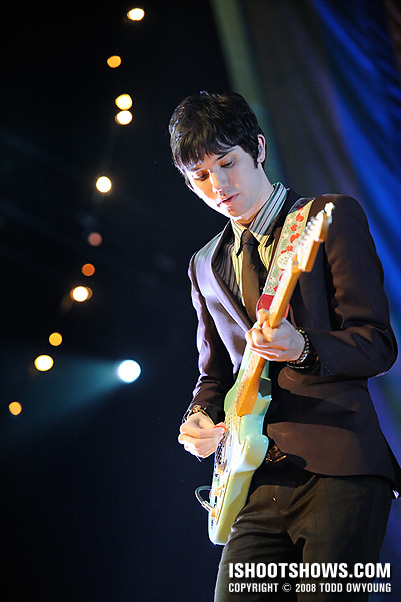 The stage was relatively deep, and there were lots of little lights in the background, particularly behind Ryan Ross, so those shots with the 70-200mm show a lot of defocused elements. great set todd! 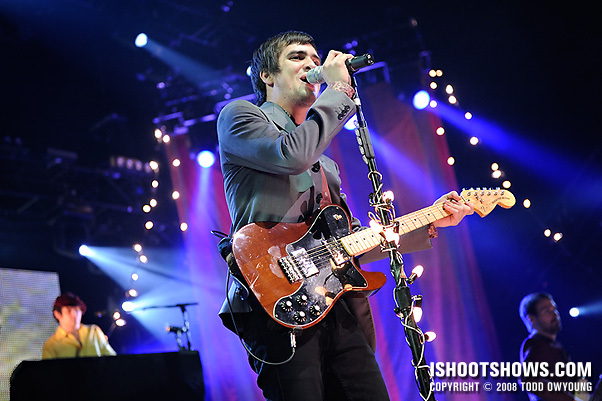 i always like to see your work, especially if i am shooting the same bands…definitely inspiring! Thanks, Kenny. Have you shot this tour yet, are is it coming up for you? its coming up….i put in for the philly show because i love shooting in philly, but they are playing on Halloween at about the same distance in VA and I was thinking they might pull out some old-cool costumes for the Halloween show, so i hope i dont miss something cool that night! What, no Keith comment? He LOVES this band!!! Seriously — I think this is one of his favorites. But, and to reiterate what I said in June — I liked their older styling better. Much more taste and originality in my mind, even if it was somewhat conformative to pop punk standards. What they did with Pretty. Odd. I was not pleased with at all. But it’s all about the photos, right? Lookin through the whole set I can see what you are saying about the lighting… looks pretty pale, certainly not the greatest skin tone, especially for the headlining band. My picks are 5, 6, 7, and 9, with the best skin tones I think in 7.
this isn’t bad, and I think I prefer this to 8, even though it’s a bit farther away; I like their facial expressions more. Great work with the lighting you had, though! 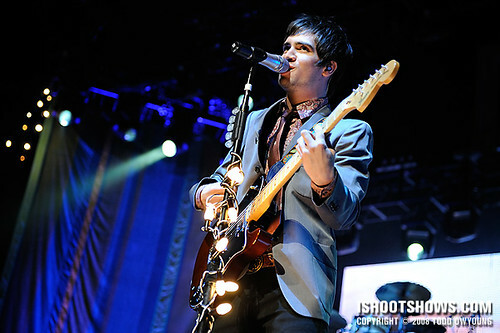 The lighting for Panic, due to the subdued nature, was a little more “intimate” for their set, if that makes sense. Not quite as bomastic as the lighting for The Plain White T’s, that’s for sure, but I think it probably fit. Thanks for the picks. With a show like this, I think subject composition have to take the lead over lighting and do a little more work. Hey Todd. I was the drummer for one of the rock band live bands at the 10-19 panic at the disco concert at Scott Trade Center and i was wondering if you got and pictures of us. Rock band live sent me some but they only had a couple. Hey Emily, let me check on that. I didn’t photograph all the groups who played between sets, but I’ll get back to you. Amazing pictures, dude. You really captured the moment in these. I love it. This is exactly what I needed after finding out the news. 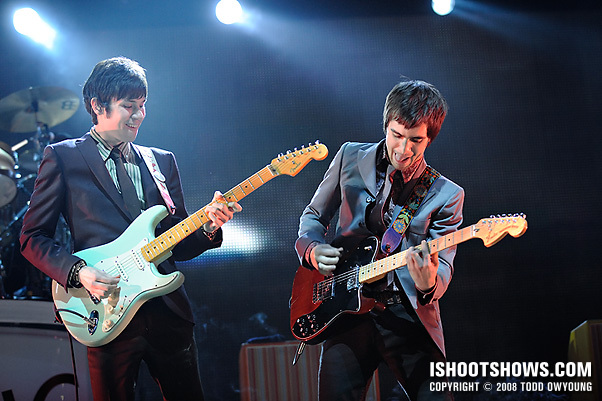 I’m glad I’ve seen them together live before, though. Thanks. Thanks for the comment, glad you enjoyed the set – I thought after today’s news about the split, fans could use a little reminder!